Note: While this review will be spoiler free, it will make references to previous books. If you haven’t started this series yet, check out VBC’s review of book 1, The Immortals. Three months have passed since Selene and Theo defeated the Classicists cult, and New York is in full Christmas mode (much to Selene’s disgust). Things have been relatively quiet for the new couple: Theo is now running the Classics department (basically singlehandedly, because cult) and Selene continues to come to aid of women all over the city (guys, if you work with wild animals, don’t piss her off, just sayin’). But when a body is found on top of the famous Charging Bull statue on Wall Street, with signs of ancient rituals, once again Theo and Selene find themselves brought into the police investigation. Initially they think it may be someone taking Orion’s lead and trying to gain power once again but it soon becomes clear this killer has set their sights much higher. Selene must once again reach out to her immortal family to track down the killer, but with all their powers continuing to diminish will they be strong enough to take on this new enemy? The Immortals was one of my favorite new releases of last year, and this sequel takes all the worldbuilding and character introductions from that first book and expands on it like crazy. One of the things I love about this series is just how vast the scope of the mythology is; it’s abundantly clear just how much research and knowledge has gone into this side of the book. I genuinely felt like I was getting a classics lesson whilst reading (learning AND having fun FTW! ), and I loved how the plot and character arcs were weaved seamlessly with all the corresponding ancient tales. However, the shear amount of backstory was somewhat of a double-edged sword, in that, phew, there is a lot going on in Winter of the Gods. It’s not that it necessarily suffered for it, more that I really had to concentrate to keep up. When most of your characters are literally multifaceted and have hundreds of epithets, things can get confusing real quick! This wasn’t the book I picked up before bed to unwind, and I found I needed to read it in chunks in order to be able to absorb everything, but I certainly enjoyed being challenged by it. The plot had so may twists, weaving brilliantly from Olympus style action to intellectual investigations. There is a definite Da Vinci Code feel to this book, with New York and it’s landmarks playing a pivotal role. I found myself constantly jumping over to Google Earth to fully visualize the setting. The pace builds to a crescendo that has consequences I can’t wait to see play out. In the middle of all this is the very new relationship between Theo and Selene. I loved that, while their feelings for each other are more than apparent, the complications of a man and goddess being in an equal relationship come right to the forefront. The conflicts they face—Theo’s mortality, Selene’s fear that being intimate will take more of her power as The Chaste One, her growing humanity (and inability to get pop culture references)—cause real, and believable, roadblocks between them, ones they don’t always know how to navigate. For me, this is one of the most complex and layered mortal/immortal relationships I read in urban fantasy for a while. 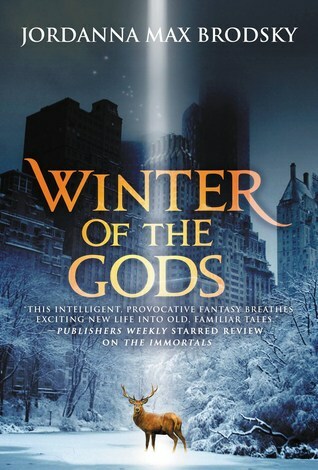 Winter of the Gods builds on the solid foundation set out in the first book, taking every aspect—complex plot, character relationships, a wonderful combination of Greco-Roman mythology and fresh fiction—and amping them up to the next level, to make an immersive and intelligent read. If you’re a fan of American Gods or The Iron Druid Chronicles you may want to check this series out. 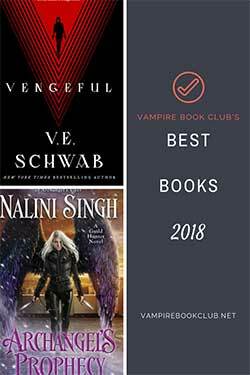 I saw this yesterday, and instead of risking reading however minor spoilers I went to read the review of the first book, which made me want to read the first book. 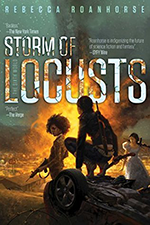 I read, absolutely did not regret, and now after reading this review, will gladly go on to read the second one, already expecting the third one I saw on Goodreads. Thanks for the recommendation, one of the best books I read because of VBC!